London production fans get ready! Producers DJ 4Force, Ed Strong, Soloman Caine and Kewba answered the call and took up the latest King of The Beats challenge. The beatmakers/producers will compete on Saturday February 27th, 2010 to determine who is the most skilled crate digger, sample chopper, and sound manipulator. 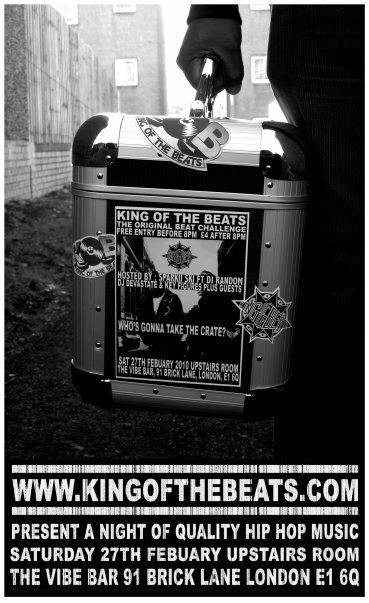 Visit King of The Beats for complete event info. Hit the break for full event flyer. I need to get me a Sound Burger. I would so love to be a competitor in this!!! Soho is one of the best areas to dig in London. Notting Hill and Camden also have some dope spots. or even needed by the plant for photosynthesis. growing indoor plants, since they assist in the process of photosynthesis. articles or reviews, but this webpage provides feature based writing.